QVI SNAP DM200 and its robotic arm are designed for enhanced productivity and has been coupled with innovations for reducing complex tasks into simpler tasks. QVI SNAP DM200 offers a large field-of-view system with telecentric optics to ensure accurate part measurements in shop floor conditions. The simple programming could be done by placing the part on the stage and selecting the start GO button. The system would then automatically find and measure unknown parts in the field-of-view. This reduces the time required in qualifying the parts and thus improves productivity. The machine also comes with an AutoID function (Auto-Identification), which recognises any known part in the field of view and will call out the specific programme for the part automatically. Additionally, because automation increases the quality assurance process and bring robots and humans closer together on the manufacturing ground, with the assistance of the robots in inspection, the accuracy and efficiency outcomes for manual tasks are increased. 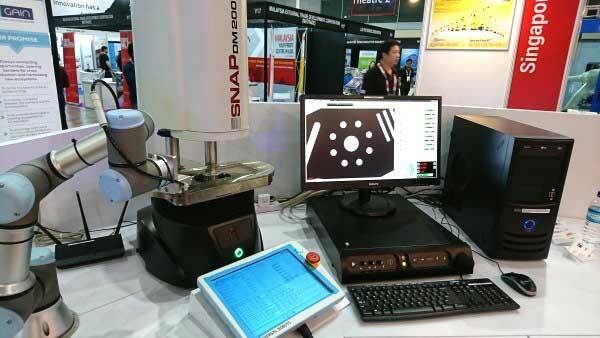 Thus, SNAP DM200 and its robotic arm are designed to help the operator mechanise processes. This leaves repetitive inspection for the robot to conduct under minimal supervision, while creating a safer working environment for the operators. SNAP DM200 and its robotic arm are also designed for enhanced productivity and has been coupled with innovations for reducing complex tasks into simpler tasks. After the inspection, the vision measuring system would communicate with the robotic arm, allowing a differentiation between the “good” parts and the “bad” parts by placing them to their designated trays.